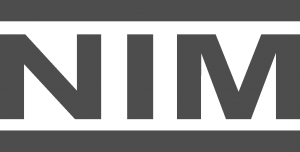 LOS ANGELES, CA – October 12, 2017 – NIM Labs has officially announced the launch of NIM 2.7 – a feature-rich update that enables increased time management flexibility alongside numerous performance and infrastructure improvements. NIM is a creative management tool designed to visualise production studio workflows. NIM was incubated in a real production setting and is designed from the ground up for effective communication – from bidding/budgeting through production management and final delivery. Version 2.7 equips teams with greater control over time card functionality, enabling producers to better manage staff’s time and deliver projects to pressing deadlines with total efficiency. Flame Connector – NIM’s integration with Autodesk Flame is now available in the full NIM suite of connectors. The Flame connector provides integration with NIM from within Flame or Flare to create published shots in NIM, add exported elements to NIM shots, export clips to NIM dailies and edits, and roundtrip NIM elements back to the Flame timeline and batchFX. Time Card Day View – Access a bird’s-eye view over producer and artist hours, with an at-a-glance perspective on users’ regular time (RT) and also users who may be going into overtime (OT) or double time (DT). The Time Card Day View enables users to monitor the sum total of hours in two distinct views: a heat-map style grid view and the list view, which displays cumulative time per user in a filterable and exportable list. The Time Card Day View also flags days on which a time card was entered on two jobs, enabling producers to determine where OT/DT should be negotiated between jobs. Modify RT/OT/DT per time card – Time cards automatically calculate RT/OT/DT based on per-crew member rules, ensuring everyone works to appropriate schedules. Any time cards outside of job rules can be manually overridden with RT/OT/DT hours, if needed. Enhanced time card design – The time card design has been updated, providing a clear, unambiguous entry form with information at a glance. Estimated task time – NIM 2.7 enables users to set estimated time on tasks, giving greater organizational control over their day. The task estimated time is actualized against time cards entered for that task, and visualized on the Task Gantt chart as a color coded representation of time utilized per task. Users can immediately see which tasks are under or over planned time. 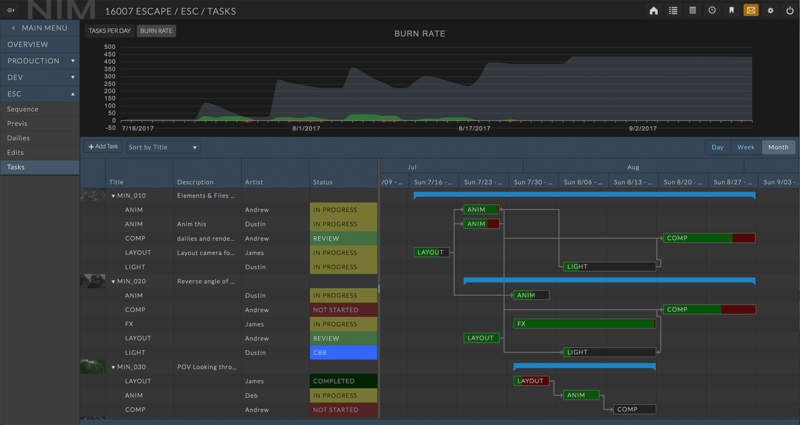 Task throughput & burn rates – The Task Gantt chart now visualizes task throughput and burn rates based on estimated task time, providing producers and studio owners with daily insight into efficiency around tasks being completed. Actualize Jobs by Time – NIM 2.7 includes a permission option that hides sensitive financial information in job actuals, meaning users only view actualization against time. Updated NIM Virtual Machine infrastructure for PHP 7.1 and MySQL 5.6, providing a significant speed increase across the board.